Our new patio is looking good, but it needs a bit of “green”, as my husband said. I didn’t want to spend a lot of money on expensive pots but I had something in mind. 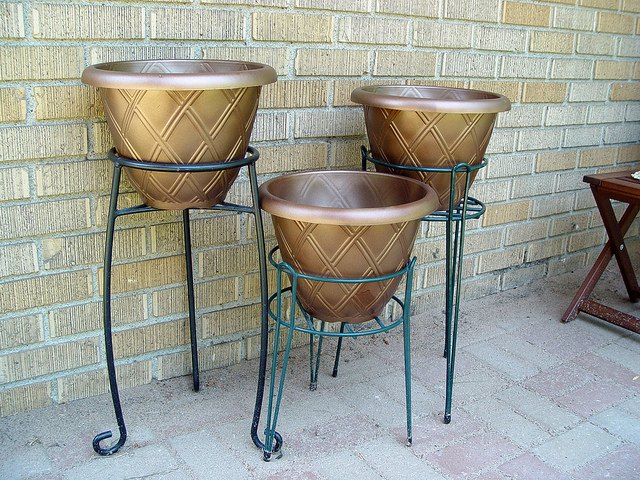 I love aged copper pots on patios — but I couldn’t spend $30++ each on pots (especially when I wanted four of them) — solution . . . spray paint some plastic ones! I found these inexpensive green pots at a hardware store for $2.50 each. 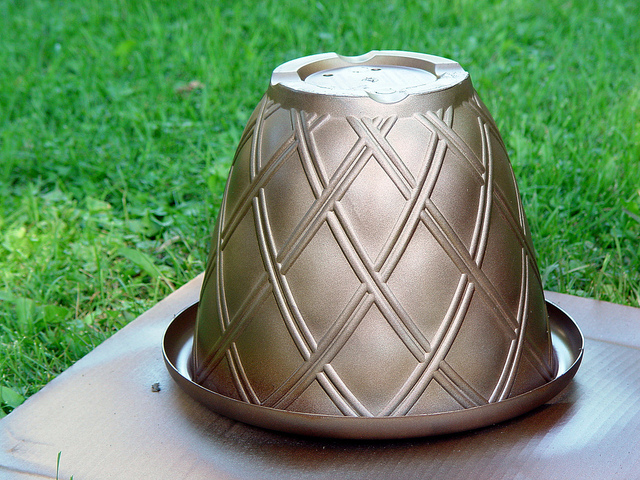 I purchased four along with a $9 can of Rust-oleum aged copper spray paint! I’ve never spray painted plastic before, although I knew it could be done. When picking your paint, make sure it’s designed to go directly onto plastic — it’s no fun if you have to prime it first. 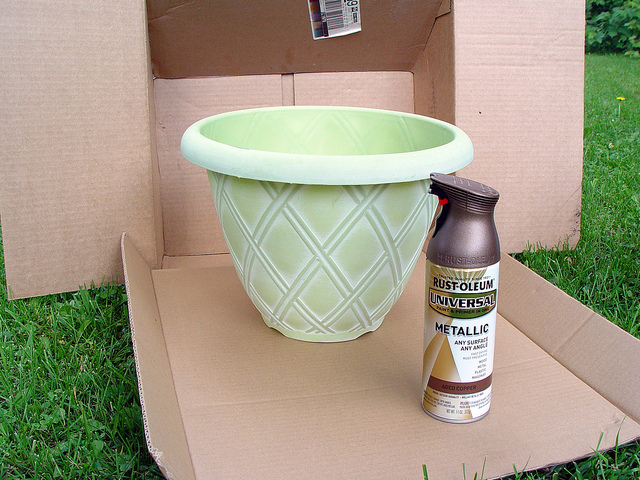 I did it outside, of course, and tried to protect the grass by using old boxes to spray on. Make sure you read through the instructions carefully on the can, shake really, really well and when you’re spraying, make sure that you’re continuously moving the can at a nice even rate. If you stop moving in one spot you’ll get an icky looking blob of paint — go too quickly and you’ll get it on too thin. 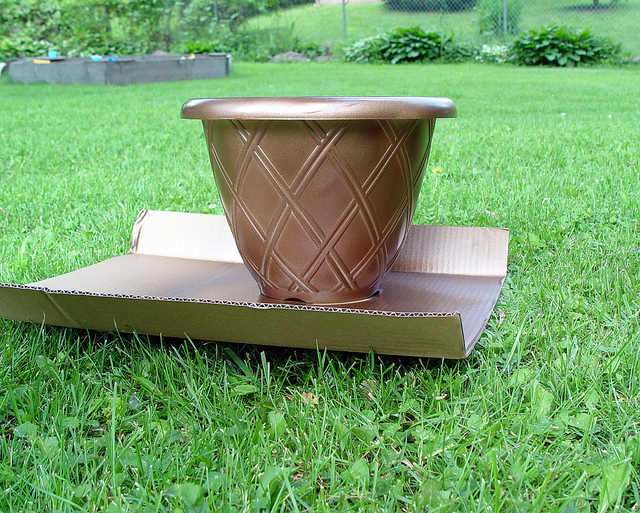 Because of the shape of the pots (with the lip at the top), I had to paint it in two different coats. One to get the top lip, inside and around exterior. Then when it was completely dry, I flipped it over and got the bottom of the pot and under the lip and touched up any spots I missed. These pots will hold only flowers, so I don’t have to worry about any contaminants from the paint into the plants as we won’t be eating them. I got the plant stands from my mother-in-law’s basement (they weren’t being used right now) and I think they look great. Just imagine them with flowers flowing out of them! 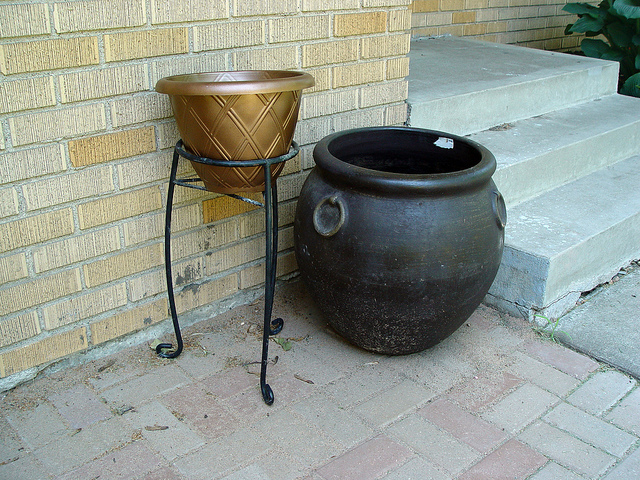 There was one more borrowed plant stand (for one more pot) and then my big purchase of the large patio pot I really liked ($40). I think it’s starting to look great — now I just need some plants for the pots! Notice my melting candles — aren’t they funny! 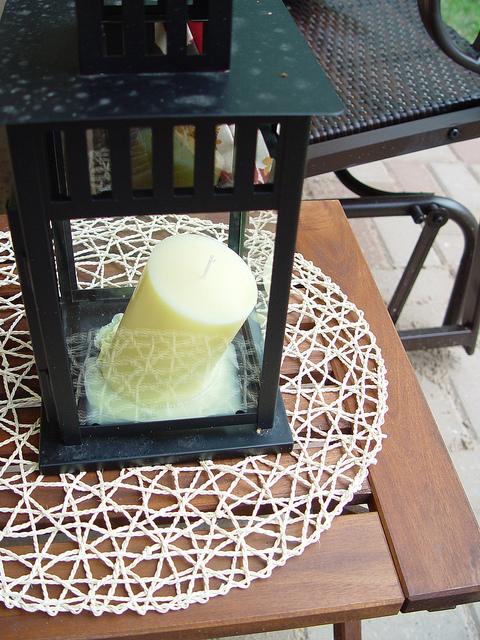 My outdoor candle holder (from Ikea) and the candles sold next to them. Too hot for them here I guess. They just couldn’t handle the heat! I am passing on the Versatile Blogger Award to you. 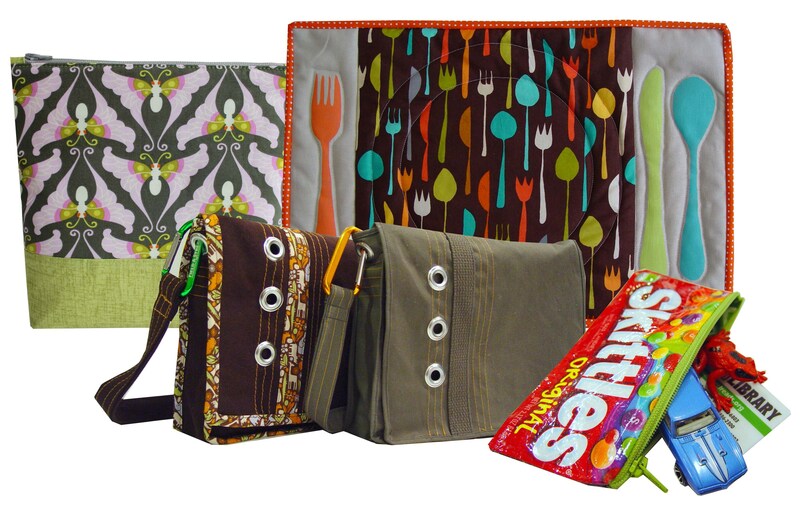 You can pick it up at http://jazzyallergyrecipes.blogspot.com/2012/06/versatile-blogger-award.html. those copper pots look great !!! 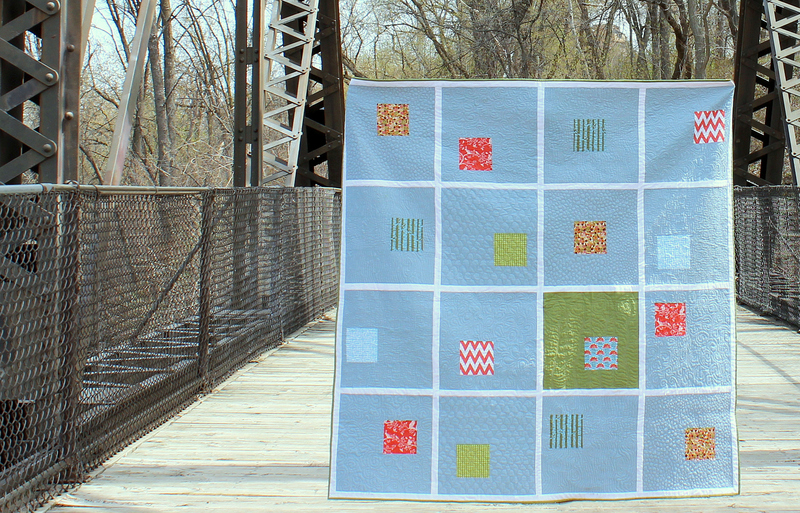 you were extra-smart to choose some with textured designs. Spray the stands all the same color…perhaps black or match the bronze! 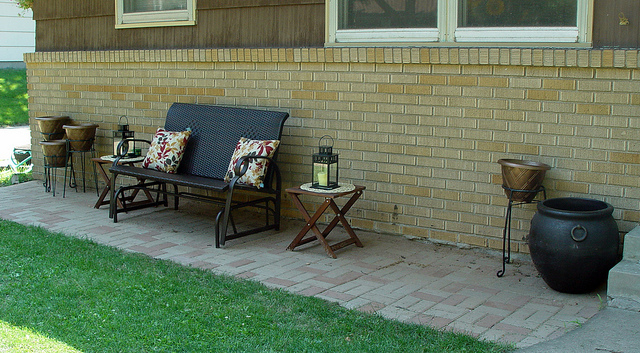 Really, Your new patio is looking good.Thanks for sharing with us. 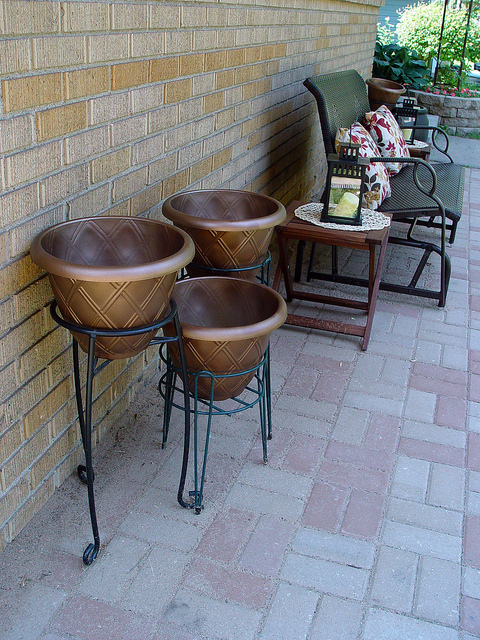 Those pots look fantastic in your garden, love it. Congratulations! You did a really good job. Your PATIO are very beautiful now. I’m doing some research on painting, too. I have an old coffee table and I want to paint it. But I have no idea. Your garden is so great! I love it! So love your blog! 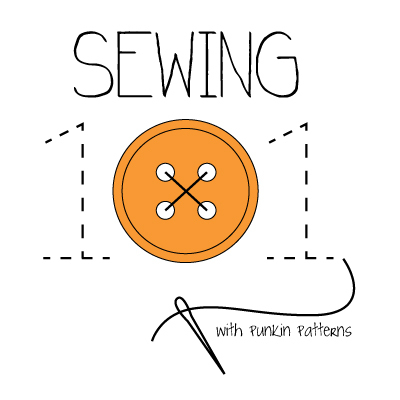 Just caught up on some amazing posts! That great ! I like the color, they look so cute. Do you use Paint Sprayer? They’re looking very real Vanessa. Of course, you can’t beat the real deal but for 2.50$ – fantastic! I’ve used Rust oleum before to refurbish old cabinets so i know they’re quality. Thanks for sharing! Amazing Patio work on display.. too good!